Typically, people associate hyperbaric oxygen therapy with the emergency treatment of scuba divers for the bends. It’s therapeutic effects though are certainly much more far reaching, now being used by patients to promote healing, decrease fatigue, force harmful gases from the body, activate white blood cells to fight infection. Hyperbaric oxygen therapy is based on simple concepts. The air we breathe has a small percentage of oxygen. Breathing 100% oxygen in a normal room increases that level of oxygen in the bloodstream by about 3% to 5%. However, breathing pure oxygen in an increased-pressure environment delivers twenty to thirty times that amount of oxygen to your body’s tissues. It’s the pressure of the hyperbaric chamber that allows for much greater absorption of the oxygen provided. 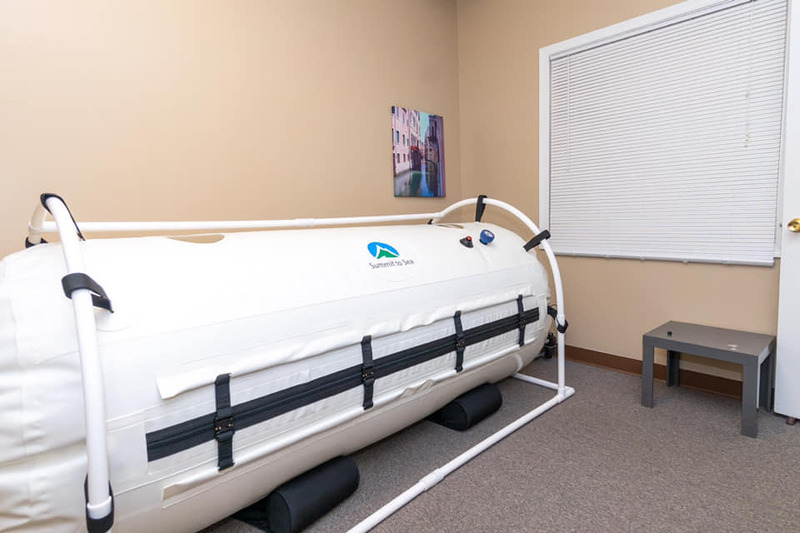 The therapy delivers oxygen to all the body’s tissues and fluids: blood, bone, organs, brain, and even to those areas with diminished or blocked blood flow. The increased oxygen enhances the ability of white blood cells to kill bacteria, reduces local swelling and allows new vessels to grow more rapidly into the affected areas — promoting the healing of oxygen deprived tissues. Retail value of $150.00 per hour.